Super Bowl 50 has descended upon our backyard with live events happening across the San Francisco Bay area. In the week leading up to the big game, our Sausalito office took a field trip to explore the NFL Super Bowl City takeover. Among the many experiences happening at Super Bowl City, we’ve narrowed it down to our top three spots pop-up spots you don’t want to miss. If you’re looking to combine shopping & lounging, while experiencing all things Super Bowl City––Levi’s Lot is your ultimate destination. 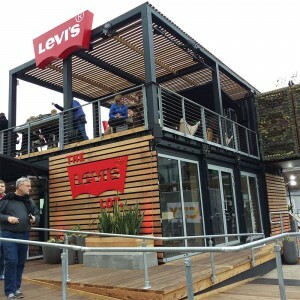 Set-up as a dual pop-up shop and elevated lounge, the Levi’s Lot offers shopping, some of some of Napa’s favorites, and have a front row seat that gives you an excellent view to the main stage for concerts. Our live event team put this destination in it’s top three for its design as well as its location being in the epicenter of the Super Bowl City. The Levi’s footprint is contained in a clean structure surrounded in a combination of steel and wood paneling to compliment the overall branding. The booth was built with unique materials centered on event sustainability and shapes that brought attention from afar, ranging from a mix of glass panels, wood, & steel. As the official card sponsor of Super Bowl 50, Visa is everywhere you are during the Super Bowl experience. In a city known for its innovation, Visa used this opportunity to project digital animation programming on the side of its San Francisco headquarters. Spanning nearly 260 feet high, Visa’s Digital Skyline projects a series of vignettes that pay homage to the Denver Broncos and the Carolina Panthers, iconic landmarks in the Bay Area, and other “suprise and delight” programming. Located right across from the Embarcadero Center, this experience is turned on at 5:30pm and will conclude at 10pm. If you’re walking through the NFL Experience located at the Moscone center, every activation is similar in nature with a digital integration element. Wilson decided to take a much more analog, yet still very effective approach. They stayed true to their roots and showcased an activation that had no digital integration, but was still effective while constantly capturing a large audience. 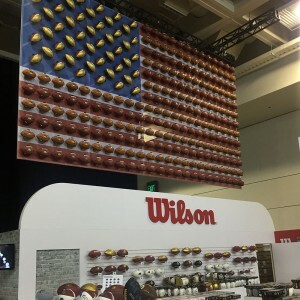 Wilson’s footprint showcased the physical process of what goes into making a football. The flow of their booth began with a clear journey of how to interact throughout the space. 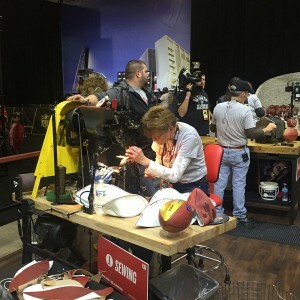 The experience was broken up into 5 stations, each sequentially labeled showing how a football is hand-sewn from start to finish, ending with a station to customize your own. A 3D logo was the main focal point of the space, a fabricated flag showcasing their hand-made footballs, and a water tower to show their history is deeply rooted in the USA. If you’re in the City (and enjoy football – or even if you don’t) make sure to stop by and check it out; just keep your head clear of all the dabbing.